Ready for MWC 2012 unveil? New Transformer on its way? 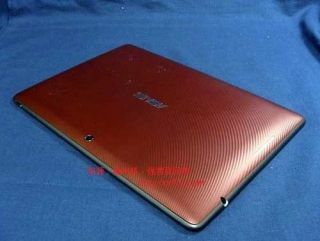 Asus seems to be about to launch another tablet in its Eee Pad Transformer range after images of a new model leaked onto the web. The snaps have popped up on French site Blogee and suggest the device carries the codename TF300T. This falls in line with the numerical tags of its predecessors, the original TF101 and the quad-core Prime TF201. Bar the rumoured model number, probable 10.1-inch screen and the interesting burnt orange back there are no other details accompanying the leaked photos. Asus has done well with its tablet offerings to date with both the Transformer and Transformer Prime models performing strongly, so it would be no surprise if it was to build on the success of the two devices. We already know Asus is holding a press conference on its Padfone tablet-mobile hybrid at MWC 2012 and we could well see more tablets announced by the Taiwanese firm in Barcelona.